Trust me, you won't be able to stop yourself waxing (or singing) lyrical about today's little beauties. By Terry is one of my favourite French Fancies. The brand oozes opulence. 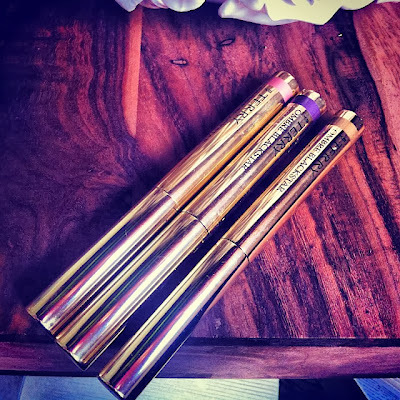 Terry de Gunzburg launched By Terry in 1998 after 15 years as Yves St Laurent’s makeup designer (it was she who designed the eponymous Touche Eclat). Oh la la. Cream eye shadows in stick form that last all night. Seriously, they'll out last anyone one of you in the party stakes. The longest wearing cream shadow I have ever tried, you get the gist. As easy as 1,2,3...twist up the bullet, swipe and blend and you're good to go. I do love me some effortless beauty. Forget finding the man of your dreams, this is the shadow stick of your dreams. It glides on the lids, not pulling or tugging. It can be used all over either as an intense colour or soft sheen and can also be worn as a liner. I have blue/green eyes and all three of these colours make my pupils pop. But Terry's treasure trove of shadows will have your back whatever your eye colour. These sticks are definately worth the splurge, I for one can't stop serenading these babies, so why not treat your lids to a bit of luxury. At £27.50 a pop let your eyes flash the cash.